With so many gifts showered upon them, brides and grooms can be forgiven for forgetting who gave them what for their shower and wedding. Even so, you can’t help but hope that yours will be one of the ones they remember. 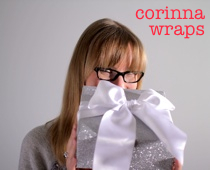 My trick (besides getting the couple a super-awesome present, of course): gift wrap it fabulously! For example, this joyful DIY paper-curl pom-pom topper will be sure to make your gift stand out among a pile of presents. Here I went with a sunny palette of yellows and ivory, but you could use any palette you choose — like say, the wedding colours, perhaps. If the soon-to-be-married-duo don’t remember what you got them, at least they’ll remember the wrapping! 1. Wrap your box. Using Scotch™ Precision Ultra Edge Scissors, cut your wrapping paper to size. Wrap the paper around your gift and secure in place with Scotch® GiftWrap Tape. Tie your ribbon around the box, finishing with a knot (no need for a bow!). 2. Cut paper strips. Using a craft knife, ruler and cutting mat, cut the papers/cardstock into strips. I used 8 1/2 x 11” sheets and cut the strips lengthwise, using the grid of the cutting mat to determine the width of the strips; you may want to experiment with different widths and lengths to find what works best for the paper you’re using and the size of pom-pom you’d like. 3. Make your curls. Roll each paper/cardstock strip around a pencil, then slide off and pull gently to loosen the curl. Aim for a balance of tight and loose curls. The number you need will depend on how large a pom-pom you want to make. 4. Attach the paper curls. Using Scotch® GiftWrap Tape, tape the end of each curl atop your gift. Cluster the curls around the knot of the ribbon, mixing the four different papers randomly. Attach as many curls as you need to get the fullness and size you desire, placing them to hide the taped ends. To finish, tuck the card beneath the ribbon. Your gift is now ready for giving! EXPERT TIP: For the curls, choose various weights of paper and cardstock; every kind will hold a curl differently, and the variety will help create a fuller and more interesting pom-pom. Delightful light feeling for summer!